In another of his “Throw-back Thursdays”, Jeff Kenney mentioned the Culver Branch of the First National Bank of Monterey in an “If These Walls Could Talk” article. This is yet another project in Easterday Construction Co., Inc.’s historic links to Culver. Easterday Construction built this branch in 1992. 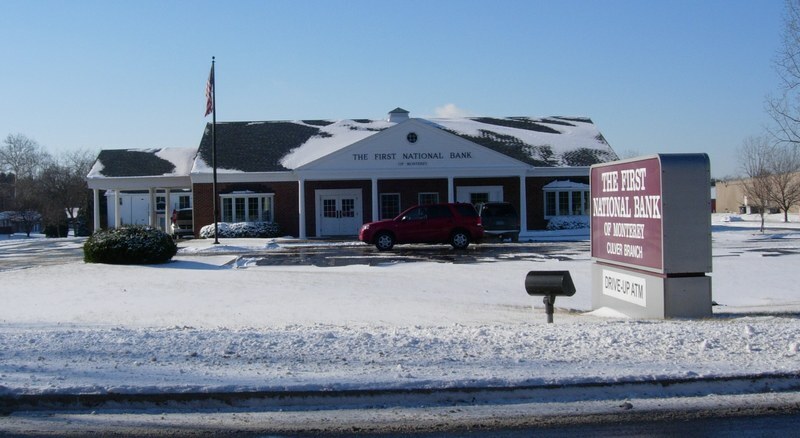 It was modeled after the branch in Winamac (To which we later remodeled and added to as well). It’s always fun to see the legacy Easterday Construction has left through the buildings we constructed and sometimes the institutions those buildings represent. Our long relationship with clients like this lead us to be the go to source when problems crop up. Those of you who use the drive through probably have noticed that someone backed into one of the columns. We’re currently working on obtaining a replacement. Unfortunately matching the column that was installed there 18 years ago won’t be as easy as just pulling something right off the shelf! One of the cool details we did for the bank when we worked on the Monterey Annex a few years back was to recreate their new logo as a 3-D metal sculpture on the front of the building. We’re still quite proud of that and the way it sets off the building.